During the abrasive blasting process, abrasive material is propelled by at high pressure onto the road or footpath surface and this strips away unwanted substances but leaves the original surface clean and contaminant free. The media used during abrasive blasting is reclaimed and there is very little dust produced during the process. Abrasive blasting also cleans mould, grease, oil and other slippery deposits from roads, paths, walkways, car parks and driveways. Concrete aggregate can be exposed by abrasive blasting to create non-slip surfaces, perfect for use in public spaces such as shopping centres, schools, industrial parks, and commercial premises. Non-slip surfaces can be created by abrasive blasting in a variety of materials and surfaces, including concrete, tiles and pavers. Surfaces are not gouged or dished when markings are removed using abrasive blasting, nor is aggregate blasted away, and so this means that surfaces do not need resurfacing or additional maintenance when markings have been removed. Removing road markings effectively is important because confusion and dangerous situations for drivers and pedestrians can be created if old markings still remain visible. This is especially the case in wet weather when road surfaces are wet, or when drivers are travelling in bright conditions facing the sun. Rubber deposits are also effectively removed from road surfaces, pavements and driveways using abrasive blasting. This can be extremely important in an airport environment, where a clean and profiled surface allows for maximum braking, as well as enhancing the brightness and appearance of markings. Removing rubber deposits and burn out marks also improves the appearance of roads, curbs and car parks. 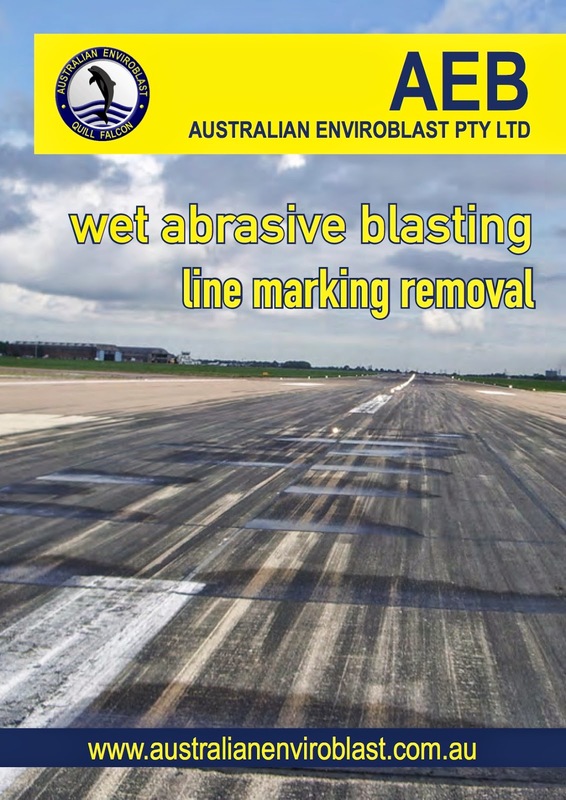 Abrasive blasting is safe, environmentally-friendly and cost effective, and Australian Enviroblast is licensed by the Environmental Protection Agency. We adhere to its high standards of environmental safety with regards to air quality, noise, water quality and waste management. Using the Quill Falcon Precision Dustless Kwikblast® System does not cause environmental damage nor consume excessive natural resources, as little water is used and there is little dust and waste produced.